Nanodyne is supplying a hard disc drive manufacturer with tiny electromechanical test sockets for verifying the functionality of the read/write head prior to permanent attachment to the suspension. This drastically reduces the scrap cost from rendering good suspensions useless by attaching bad heads (which previously required attachment to a suspension to determine whether the head was good or bad). Test probes used in the sockets are shown below. The test socket includes an electrical contact probe assembly shown at right, with 2 fixed and 7 flexible contacts at a pitch of 77.5 micron (0.00305 inch). The entire contact probe assembly is fabricated by laminating 25 separate layers together. The probe assembly is 0.246 x 0.488 x 0.875 mm (0.010 x 0.019 x 0.034 inch). Each layer is photoetched from thin metal foil. 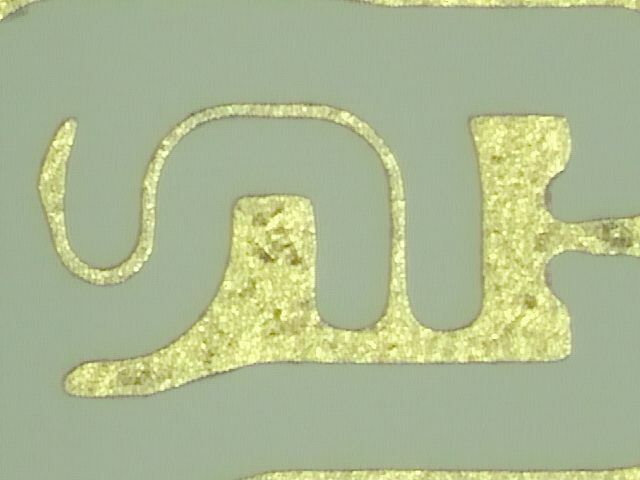 10 of the etched layers are then given an insulating coating to provide electrical isolation between the contacts. 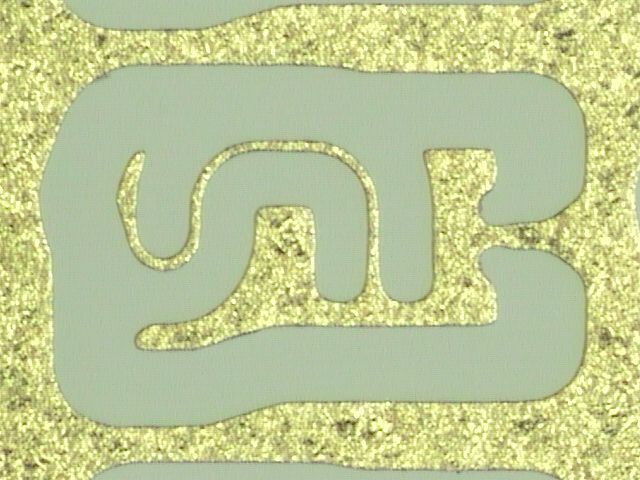 The three images directly above are photos of the etched flexible contacts for the probe block assembly. 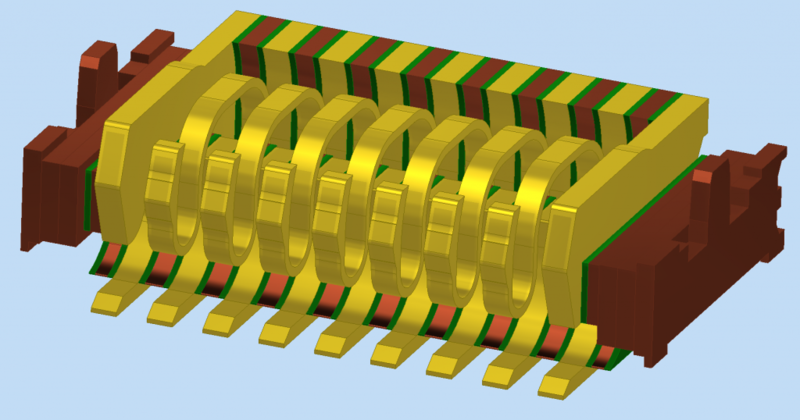 The width of the spring (the narrowest feature) is 15 microns (0.00059 inch). This is only 38% of the 40 micron thickness of the material. Most etching facilities will not attempt to etch anything with a feature size less than 100% of the thickness. A full sheet of the etched parts is 2.1 by 2.4 inch, and contains 6596 individual parts. Nanodyne can custom design and manufacture electrical test probes for semiconductor wafer, printed circuit board, and IC testing, with probe pitches as small as 50 micron. Nanodyne can also design and fabricate laminated multi-layer etched metal structures with internal features such as vacuum ports and springs. 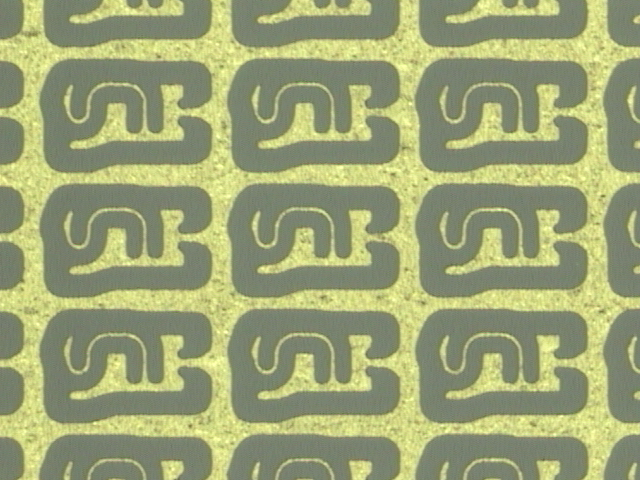 The structures may include electrical isolation layers. Contact us to discuss your needs.